Nearly seven in 10 Americans believe Donald Trump and his family can keep his business empire while serving as president of the United States, according to a new poll published Wednesday. 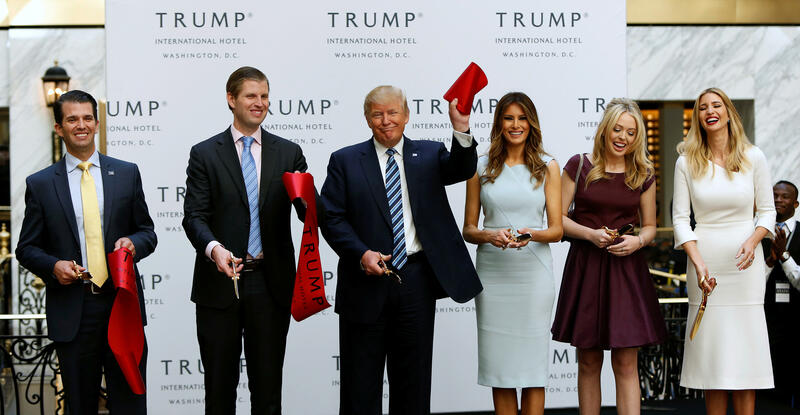 The Bloomberg Politics survey found that 69 percent of people think it’s too extreme to force Mr. Trump and his family to sell their business enterprise to avoid conflicts of interest. A little over a quarter of Americans (26 percent) say Mr. Trump should sell his businesses, while five percent of Americans remain unsure. About two-thirds of people think Mr. Tump needs to choose between being president and being a successful businessman. The survey results come just as the president-elect announced, without offering up proof, that he sold all his stocks in June-- a declaration prompted by continued scrutiny over his potential conflicts of interest once he moves into the White House. Mr. Trump has previously said that he would have his children take over the business to avoid conflicts of interest, but his children have already played prominent roles during his presidential transition. The Bloomberg poll also showed a post-election bump in Mr. Trump’s favorability numbers, which tends to happen among victorious candidates. Fifty percent of Americans view Mr. Trump favorably, compared to the 33 percent that saw in a positive light back in August. The president-elect’s ratings, however, lag behind President Obama’s numbers just after his first election: According to a Gallup poll released in January of 2009, Mr. Obama had a 78 percent favorability rating. After the way Mr. Trump has conducted himself in the weeks following the election, 55 percent of those surveyed rate themselves as more optimistic about the incoming administration, the poll shows. Thirty-five percent are more pessimistic. A majority of Americans -- 79 percent -- believe President-elect Trump should tone down the heated rhetoric of his campaign days. When it comes to Mr. Trump’s Cabinet picks, 51 percent approve of his nominations so far: Ninety-one percent of Trump voters are in favor of them, while 76 percent of Clinton voters disapprove. A slight majority -- 54 percent -- believe the president should be picked by the popular vote: Eighty percent of Democrats and those who lean Democratic say that, while 68 percent of Republicans and Republican-leaning respondents think the Electoral College should continue deciding the presidency. Hillary Clinton, Mr. Trump’s Democratic challenger, is currently winning the popular vote in the U.S. by over 2.5 million ballots. The poll of 999 American adults has a margin of error of plus or minus 3.1 percentage points, higher among subgroups. It was conducted Dec. 2-5 by Iowa-based Selzer & Co.